Hunter Education instructors make immeasurable contributions, volunteering their time, energy and resources to promote safe and ethical hunting and, by recruiting and mentoring thousands of students, assuring our hunting traditions are passed to future generations. In recognition of outstanding efforts among the thousands of dedicated Hunter Education instructors, Gallery of Guns is proud to annually recognize and reward six instructors who have gone above and beyond, instructors nominated from among the legion of dedicated instructors making such a difference in so many lives. In this issue, we highlight three Gallery of Guns Champions of Hunter Education winners. Watch for our next issue in which we announce three more deserving award winners. 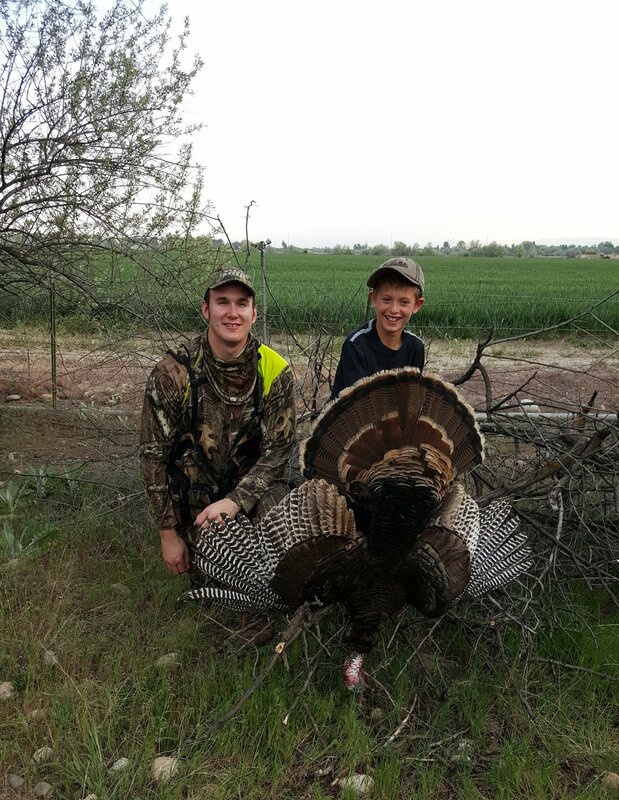 “Christopher Collins embodies what it means to be a hunter education instructor and role model to both youth and beginning hunters,” explained Idaho Southwest Region Volunteer Services Coordinator Jaime Creson in nominating Christopher for the award. An instructor since 2013, Christopher has taken the lead on 33 courses, averaging 11 courses per year, and assisted six others, certifying 689 students. For his outstanding contributions, he received in 2013 the Jack Edwards Rookie of the Year award, a prestigious award unique to the Idaho Fish and Game’s southwest region and in 2016 received the program’s highest honor, the Commissioner’s Continuing the Hunting Heritage award. To qualify, recipients must reach the 3,500-point level, a level that takes most instructors at least 15 years to reach. Christopher achieved it in three years. Christopher participates in most IHEA-sponsored youth hunts, mentoring students and sharing his knowledge during their first hunt. He is currently working on classroom training videos that will be linked to the IHEA website to help instructors. Christopher is also producing a video to advertise IHEA at new instructor orientations. “Christopher always goes above and beyond volunteering for every project,” Creson said. For example, Christopher and his wife, Crystal, videotaped two mentored hunts, then gave each participant a keepsake video of their hunt. On a more personal level, Christopher stepped up when a young hunter education graduate lost his father and grandfather, leaving him with no one to teach him hunting skills. Christopher invited the boy and his mother to his home to discuss firearm safety and hunting skills; then accompanied the boy on a coyote hunt—and has made plans for a hunt this fall. Christopher got his start in hunter education as a scoutmaster, earning his NRA certification so his scouts could earn shooting merit badges. But he knew there was more he could do. It bugged him when he saw unethical people taking kids hunting, starting them on the wrong foot. “I wanted to try and make a difference,” he said. Christopher said he’s learned to balance hunter education with his career and family life. He’s a senior business analyst at Micron Technologies working on mobile applications to allow employees to work from their phones. For 26 years, Pam has donated countless hours to teaching hunter education to her community and throughout the state, Futral said. A charter member of Alabama’s hunter education association, Pam has served as the board’s secretary/treasurer for seven years. Pam’s enthusiasm for teaching knows no bounds. She has helped with NRA’s Youth Hunter Education Program, the Alabama Cooperative Extension System’s 4-H shooting sports program and Alabama’s Step-Outside events. And, for the past 14 years she has volunteered at Alabama’s biannual Becoming an Outdoorswoman program where she teaches “Beyond Band-Aids,” drawing on her knowledge and experience as a registered nurse to teach basic first-aid and survivial skills. Pam is able to combine three loves into hunter education instruction: her love of family, nursing and hunting. Pam is an acute-care nurse practitioner and also teaches nursing at a community college. Her Becoming an Outdoorswoman course is popular. “A lot of them don’t have any idea the kind of things you might see or encounter when you are in an outdoor setting, even just hiking,” she said. Hunter education provides similar opportunities. “There are a lot of children now who have only their mom taking care of them and many of those moms don’t know the first thing about hunting or safety,” she said. “A lot of times if children are interested the moms will come so we get to teach both of them and help them have a safe and hopefully successful hunt. But even if they’re not successful as far as taking a deer, it is successful in that nobody gets hurt and they’ve enjoyed being in the outdoors. As skilled and dedicated as he has been as a hunter education instructors for more than ten years, Nathan Pettigrew’s contribution has had far-reaching effects beyond the Hunter Education classroom, according to Texas Hunter Education Administrator Steve Hall. In addition to certifying more than 1,300 students, Pettigrew serves on the Texas Hunter Education Instructor’s Association board of directors; has attended 22 conservation and ethics-related workshops; has served as a bowhunter education instructor since 2007 and, since 2015, as Hunter Education area chief, certifying not only hunter education students but also recruiting and training new instructors—as well as monitoring instructors in his area and assisting them in the classroom and field. “Nathan has crossed the classroom/outdoors barrier,” Hall said, by introducing photography hunts in cooperation with the Texas Youth Hunting Program (TYHP), a non-profit organization dedicated to introducing hunting and providing hunting opportunities for youths. Nathan serves as regional coordinator of TYHP, assisting other volunteer “huntmasters,” providing guidance and equipment. “The youth hunts hold a special place in Nathan’s heart,” Hall said. “Not only does he see the kids on a daily basis in the classroom, but Nathan also sees them after school at House of the Sycamore Tree.” Nathan and his wife, Micah, founded House of the Sycamore Tree in 2013 as a place where troubled youths and adults learn useful skills to help them cope. House at the Sycamore Tree is described as “the best place in the Permian Basin that offers individuals with disabilities and at-risk (challenged) youth a place to live life,” Hall said. Nathan’s start in hunter education came when he was a high-school ag teacher. “I wanted my kids to experience the outdoors so I talked to my administration and got approval to teach hunter education in class,” he said. From there, the classes broadened, reaching into the local college. “The outdoors has been important to me my entire life,” he said. “Since I was five years old I’ve spent every day of my life out there, every day I can. If I’m not actually in the field, I’m thinking about the field. It’s a heritage. It’s everything we learn about ethics and what’s right and wrong, and integrity. Nathan is now a biology instructor in an alternative education center for at-risk high-school students. His wife, Micah, is a special-needs teacher. “So we combined both our crafts” and opened the non-profit House of the Sycamore Tree. This year, with a grant he received, he plans to implement a TYHP photography hunting class for at-risk students, combining hunter education, outdoors and photography. He also takes special-needs kids hunting on his personal lease and a lot of weekends are spent on TYHP programs. “Every bit of my life revolves around hunting and being in the field and every bit of my life revolves around hunter education,” he said.